Show don’t tell in your college essays. Michael Phelps shows rather than tells. Ryan Lochte? Not so much. In the Olympics, you may have noticed that Ryan Lochte talks a big game. He was pretty confident headed into these Olympics. These were going to be his Games. Michael Phelps? It would no longer be his time. And how did that turn out for Lochte? Don’t get us wrong — Lochte had some really nice swims. 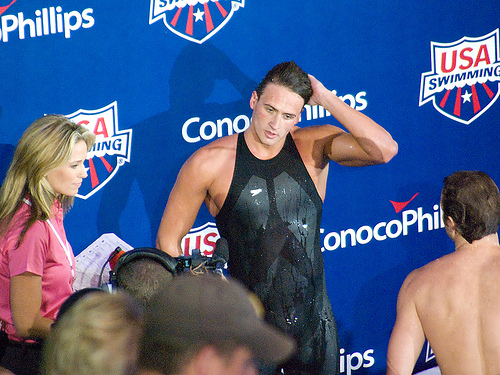 His gold-medal winning swim in the 400 IM was nothing short of dominant. But Lochte failed to dethrone Phelps. He may have talked a big game but the more modest Phelps let his swimming do the talking for him. In your college essays, follow the example of the most decorated Olympian of all time. Don’t follow the example of the Grillz-wearing Lochte. Don’t say that you like reading in your college essay. Don’t say that Sandra Gulland is your favorite author. Instead, show us that she is. In your essay, share your passion for the story of Josephine Bonaparte. Let us know how she inspired you and how her rise from rags to riches touched you. Let us know how this single mom and divorcee’s rise to become the most powerful woman in all the world is a story that transcends time. Share with us the great love story of Napoleon and Josephine. Don’t tell us they loved each other. Let us know what their love meant to you. That’s what we mean by taking a page from Michael Phelps instead of Ryan Lochte. Simply listing your favorite books — telling rather than showing — won’t be of help to you in the highly selective college admissions process. You’ve got to show college admissions counselors that you love reading, that you have great intellectual curiosity, and that you’re interesting. Books can be a great way to do that, but you’ve got to go about it the right way. The Michael Phelps way. While you’re here, check out this post on Books and College Essays.